Merton Council was chosen by Resource London as one of nine London councils to be part of their EU-funded pilot initiative, encouraging people to eat more healthily, reduce the amount of food they throw away and recycle the inedible parts to the food using the council’s free, weekly food waste recycling collection service. Called Small change, big difference, the two-year campaign shines a light on the food Londoners throw away every year at a cost of £1.4 million. On top of this, councils pay around £50 million to dispose of the wasted food. It also highlights the environmental damage caused by the waste as well as the hole people burn in their pockets with every piece of food they throw out. Locally, 3,400 tonnes of food waste is collected in Merton every year. 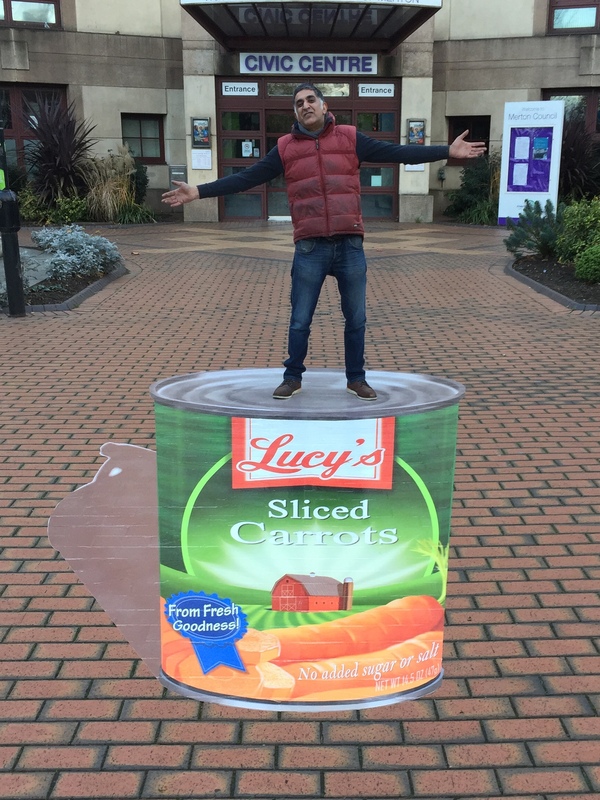 Merton’s collected landfill waste contains 20% food waste, which could be recycled. That equates to 9,361 tonnes of food waste collected going to landfill each year, costing the council nearly £1million each year to dispose of it. The more residents use the council’s free, weekly food waste collection service to dispose of their food waste, the better it is for the environment. It also saves the council money meaning it can invest further in the council services. Contributions made to the campaign in Merton include a series of short films showing tips from residents and people who work in the borough, on using food well and reducing waste. Photographs of raw food art have been sent in by residents for a competition, with the winning entries displayed on hoardings around the borough. 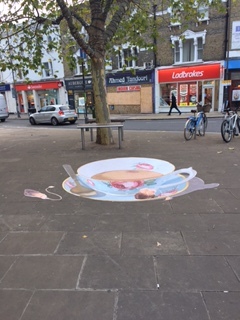 The council also teamed up with Wimbledon Art College student Megan Dennis, who created a work of art as part of the campaign called Cornucopia. The horn of plenty is on display on Fair Green in Mitcham and represents the bounty of food available in wealthier countries and the culture of recycling against the reality of 20% food wastage and the environmental and financial impact of that waste. The sculpture will be in place until 15 December. 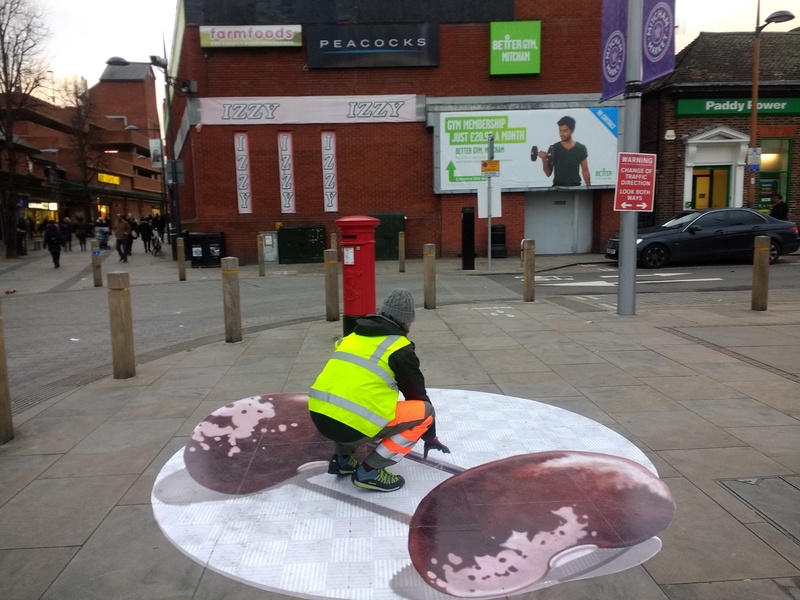 Three dimensional pavement art has sprung up in Wimbledon, Morden and Mitcham town centres along with the messages “make your meat go further”, “get canny with your cooking” and “recycling isn’t a strain”. All have a call to action to eat healthily and recycle. Looking to 2018, Merton will be publishing a calendar to include food tips. These will be distributed to residents, clubs, libraries and community centres. More activities are planned for next year too, so watch this space.